..:: BHASABHARATHI --> Mohiniattam ::..
Is customary to commence any perfomance with an invocation to Lord Ganesha. There are many varities of such introductory offering to Lord Ganesha. 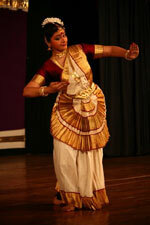 Structured and presented from the tradition of Kerala like Marma Ganapathy from Agastia Muni's Marma Shastra. Ganapathy Tyani which is from the repertoire of the temple music. The term Mukhachalam is borrowed from Kathakali in which it is used at the opening of a peformance to signify the various ragas and talas used in the repertoire. The meaning of the word itself is the movement (Chala) or the opening(Mukha). There is scope to create a garland of Kerala rhythms and ragas, which are appearing in the ensuing programme. Niram means colour or Varnam. Here Niram is an item based on the figure of Kali as drawn on the floor with five kinds of powder in five natural colours and the music sung on the side of such figure of Kali, which is traditionally called "Niram Padal". 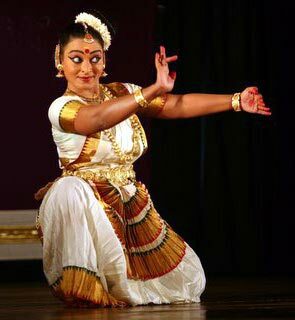 Apart from Swathi Padams we have incorporated many krities from Manipravala literature and Sangham literature like Ardhanareeshwara dance from Chilapathikaram, lyrics from Kalithokai, Dandakam from Unniyadicharitam and the like. Tatvam imbibes its philosophy from the circum-ambulation of the devotee around the temple. It also depicts the ritual offfering to the sacrificial stones around the temple. Jeeva represents the voyage of the devotee towards the sanctum of his favourite deity climbing through the steps known as Sopanam. The progress of this slanting journey signifies a growth towards salvation - a point of union with the ultimate. It is a growth from the athivilamba (the slowest) to the athidruta (the highest) speed, which is technically called in the Kerala percussion ensemble as progression towards the needle end of rhythmic experience. 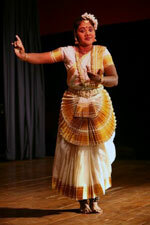 The Sopanam style of Mohiniattam declares its adherence to the music of Kerala. Contrary to the usual practice of employing the oft-repeated carnatic rhythms, Sopanam Institute has introduced Kerala's own rhythms as defined and enumerated in the thullal works of Kunjan Nambiar, the fore runner of the aesthetic revolution in Kerala, who came out of the conventional concepts and established practices of the elitist arts and drew inspiration from the numerous folk musical and dance forms of the common people. His works are specially noted for their indigenous quality especially in the wide range of rhythms, which provide an organic vitality. Sopanam has used rhythms like Roopam, Champa, Karika, Panchari (Ayyadi), Muri Adanta, Adanta, Chempata, Kundanachi, Marmam, Lekshmi, Kumbham etc., based on hridaya tala or the rhythm of the heart beats which gives its unique regional flavour. Use of the ragas also is specifically designed to suit and justify the rhythm structure.